Geer says the ad in the Ford race “makes the Willie Horton ad look like child’s play,” but he stands by the thesis he developed in In Defense of Negativity: Attack Ads in Presidential Campaigns. “Negative ads are underappreciated, because they are actually much more substantive than positive ads. If you want more issues, the issues to be more specific, the issues to be documented, and the issues to be the important ones to the public, it turns out negative ads have that more than positive ads,” said Geer in the interview. 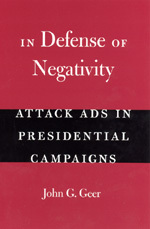 Geer’s timely, controversial take on political campaign techniques is featured in our 2006 Election Anthology, where you’ll find many books relevant to the midterm elections.